A Washington University in St. Louis drug discovery program has recently received three grants totaling more than $5 million from the National Institutes of Health (NIH) to develop new therapeutics for respiratory diseases. The target illnesses range from the common cold to life-threatening lung disease. The projects include designing next-generation drugs to open the airway passages by controlling mucus production as well as new agents to fight off respiratory infections by boosting the immune system. The program is based in the Division of Pulmonary and Critical Care Medicine, led by pulmonologist and principal investigator Michael J. Holtzman, MD, the Selma and Herman Seldin Professor of Medicine. The largest award, totaling just over $3 million will support a project focused on optimizing a chemical compound Holtzman’s group developed to block a key checkpoint in the mucus pathway. 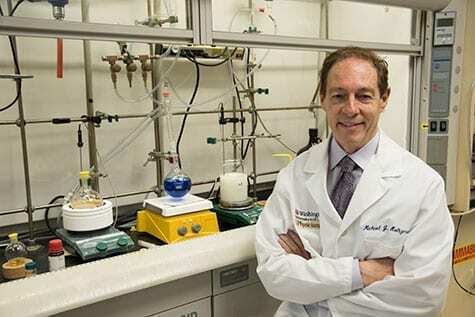 In past work published in The Journal of Clinical Investigation, Holtzman and his colleagues identified an enzyme target known as MAPK13 that is required for producing mucus from cells that line the breathing passages. Holtzman’s team then designed a proprietary MAPK13 inhibitor based on their analysis of the structure of the enzyme bound to the drug. Initial testing showed that the newly designed compound safely and effectively blocked inflammatory mucus production without changing normal physiological production in experimental models. For this phase of the project, Holtzman worked with the university’s Office of Technology Management to patent the compounds and license the patent to a startup company he recently formed. Another two awards totaling $2.5 million will address the need to control viruses that drive acute and chronic respiratory disease. These awards are designed to develop the next generation of antiviral drugs. Similar to the case for anti-mucus strategies, there is a crucial need for drugs that battle common viruses that cause respiratory illness. To address this issue, Holtzman’s group came up with a strategy to improve the body’s interferon signaling pathway. This pathway provides the main means for antiviral defense, but whether it could be safely adjusted to provide better antiviral defense was uncertain. The group’s initial work showed that this pathway could be genetically engineered in cells and animals to markedly improve the control of a broad range of existing and emergent viruses. The team then screened chemical libraries to identify a small molecule that could mimic this benefit. After screening thousands of compounds, the research team arrived at one that was safe and effective for enhancing interferon signaling and controlling viral infection in human cells. They have received an award of nearly $2 million to optimize this compound and related ones guided by structure and mechanism of action. In the meantime, the group also received an award of $500,000 to perform a clinical trial of its first interferon signal enhancer candidate. In the coming months, the researchers will seek approval from the Food and Drug Administration to test the safety of a new formulation of their antiviral compound for intranasal dosing. If they achieve safe delivery of their formulation, they will proceed to test its effectiveness against the common cold virus in a first-in-patients clinical trial. The Drug Discovery Program, in its fourth year of operation, is envisioned as a model for academic development of new therapeutics.